Thanks for visiting MicrogridKnowledge.com. We welcome you to participate in discussion on our site and share our content links through social media, email, text messaging and around the web. In doing so, please follow the legally binding terms that we describe here. Please note that we may update these terms from time to time, and you are required to abide by the most recent version, so please read this section on occasion. Your visit to MicrogridKnowledge.com indicates that you accept our terms. We welcome you to link to MicrogridKnowledge.com’s content without our consent. The link may be accompanied by the headline and the first one or two paragraphs of an article. Or when linking to a podcast, you may include its title and its description. You may also quote text or data from our site, but we ask that you attribute the quote or data to MicrogridKnowledge.com with the proper link where appropriate. You may print material found on MicrogridKnowledge.com for personal use. If you wish to distribute multiple, printed copies, please contact us for permission at Kevin@MicrogridKnowledge.com. Please provide the article link and title, your organization’s name and contact information, and a brief description of how you plan to use the article. 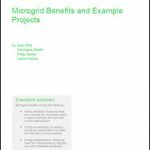 Microgrid Knowledge does not post guest articles or press releases which link directly to a registration form without the expressed written consent of the Publisher or Editor-in-Chief. We welcome your ideas and encourage debate about energy issues in the comments section of our site. We ask that all discourse be courteous and on topic. We reserve the right to remove any comments that violate our terms, including those that are vulgar, obscene, hostile or fraudulent. You also may not: defame character or disparage another’s company or product; link to sexually explicit material; engage in false impersonation; post advertisements or solicitations or engage in other offensive, illegal or commercial activity. MicrogridKnowledge.com uses commercially reasonable efforts to screen advertisers and sponsors, yet has no liability for any transaction, communication, representation or purchase between you and our advertisers or sponsors. This includes the delivery of goods and services and their payment, and any other transaction, warranty or representation between you and the third party advertiser. MicrogridKnowledge.com strives to achieve the highest standards in communication and accuracy. We cannot, however, guarantee that our content will always be error free. Please contact our editors about any material you consider inaccurate. We will review the material, and if a correction is warranted, will change the content in a timely fashion. Commenters and content providers are responsible for the legality, accuracy, originality and any confidentiality associated with their submissions and posts. Our editorial staff does not, as a matter of practice, submit articles or podcasts for pre-approval to sources who we quote or interview. MicrogridKnowledge.com may be used for lawful purposes only. We are not liable for any damages from downloading content or any other use of this site. This includes loss or injury caused by our negligence or by issues beyond our control. No information submitted to MicrogridKnowledge.com shall be deemed confidential or proprietary. MicrogridKnowledge.com is a division of Energy Efficiency Markets, LLC and based in the US in the state of Massachusetts. These terms are governed by US and Massachusetts law. You agree that a Massachusetts court is the proper forum for any claim arising under these terms. If any provisions of these terms are contrary to law, all other provisions remain in full force and effect. The failure of MicrogridKnowledge.com to enforce any provision does not constitute a waiver of the provision unless acknowledged by MicrogridKnowledge.com in writing.